... more cost effective than any control solution in the market! The Productivity3000 programmable automation controller (PAC) is a compact logic controller that combines the features and capabilities of a PC-based control system with that of a typical programmable logic controller (PLC). The Productivity3000 PAC offers you a more powerful control solution that is easier to use and more cost effective than any control solution in the market. 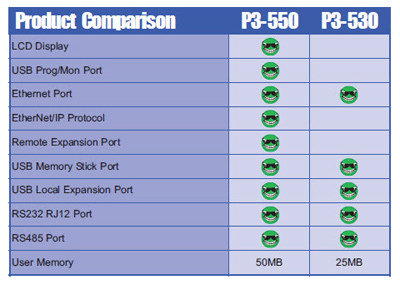 The P3-550 is a full-featured, high-performance CPU. Features include a 4 line x 10 character LCD display and seven communication ports which support USB, Ethernet and Serial devices. The P3-530 is a lower cost full-featured, high-performance CPU (without the LCD display) and with five communication ports which support USB, Ethernet and Serial devices. The P3-EX high-performance expansion module provides local I/O expansion to a CPU or Remote I/O. Includes 6-foot USB expansion cable. The P3-RS is a full-featured, high-performance Remote Slave module. Features include a 4 line x 10 character LCD display and five communications ports which support USB programming/monitoring, USB local expansion, Ethernet, and Serial devices. Up to 16 P3-RS Remote Slaves can be connected to a single P3-550 CPU remote I/O network. The P3-RX is a lower cost full-featured, high-performance Remote Slave module (without the LCD display) and with four communications ports which support USB local expansion, Ethernet, and Serial devices. Up to 16 P3-RX Remote Slaves can be connected to a single P3-550 CPU remote I/O network.